Ah yes, I remembered the "Vehicles with original weight exceeding 1500kg will not apply the 20% rule but will have a minimum allowed competition weight of 1200kg." rule wrong. An ultra-light car with less power would make sense in a power-to-weight ratio. However, a different issue is that you need power to push all that aero forwards, also these ultra-light cars all tend to be small hatchbacks, which have an aero deficit per the rules. The Tilton and Nemo Lancers had large areas of their chassis removed(for example the Nemo Lancer had it's B-pillar removed to save weight) to either cut weight, or to allow for aero(think underbody) . A hatchback simply doesnt have(or has a lesser) this possibility. wesley123 wrote: Ah yes, I remembered the "Vehicles with original weight exceeding 1500kg will not apply the 20% rule but will have a minimum allowed competition weight of 1200kg." rule wrong. A car thats 775 Kg lighter would not need anywhere near as much aero to achieve the same (likely much faster) cornering speeds though so it would have much lower drag as well. As mentioned I would use a Kei car like a Suzuki Capacino or Honda Beat not a hatchback, you get Mid Engine RWD and a tiny frontal area (so even less drag) and just the engine change would give you a 40kg weight reduction. Removing weight is a self feeding spiral of happiness, the lighter you make it, the smaller things can be, which makes it lighter again which means more things can be made smaller which means its lighter again and so on and so on. i imagine a big deciding factor is what engine the tuner has experience tuning with. I have a car running in WTAC Pro/Pro-Am (Astra) below. The work/engineering/aero etc in the top teams is incredible and my car is built by the workshop that also works on the Tilton Evo. It becomes very apparent very quickly what does and does not work. We moved the front around aero around multiple times and the sweet spot was so easy to determine from the data in suspension compression, corner speed, braking etc etc etc. 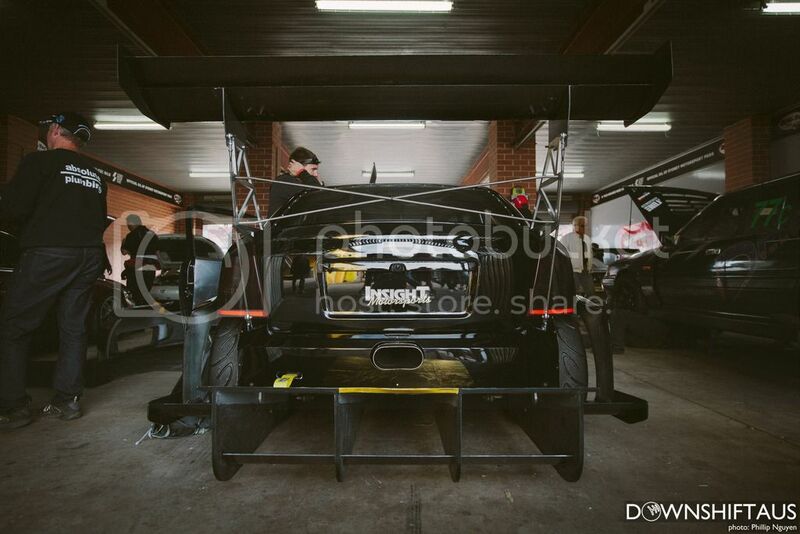 Also, its not only about downforce, its about downforce balance, suspension, engine tractability, brakes etc etc etc! As for power, cars are running 500 to 1000hp. When you get cars running 700+ hp and around 1000kgs with good downforce they will usually be VERY quick!! Last edited by aussiegman on Thu Sep 17, 2015 8:37 am, edited 1 time in total. Nice Opel Astra! Do you dare sharing numbers with us, since we are on a technical-oriented forum? 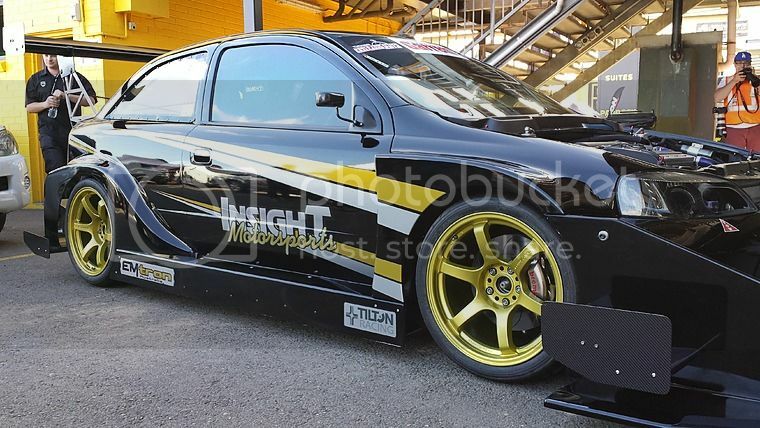 Looks pretty cool, will check it out at WTAC. MadMatt wrote: Nice Opel Astra! Do you dare sharing numbers with us, since we are on a technical-oriented forum? BTW, for the "wing behind rear tire" deal, I guess McLaren don't know what they're doing? Take a look at the 650S GT3 car. I know you like andrew very VERY much, but I didn't ask about his numbers, I asked more details about this Astra. As for the McLaren, showing a picture of a car doesn't mean it works, is efficient, or good. I can show you a picture of my VW Golf fitted with a wing on the roof, it doesn't mean its good, isn't it? We are on a technical forum where people here are supposed to be engineers or as it is the case often, engineers-wannabe. Scientists rather than artists if I may say so. Judging something technical without numbers makes you all but an engineer I'm afraid, and therefore I am not interested in discussing this any further. Sorry, but someone who has been mentored by and worked with some of the same legendary aerodynamicists at NISMO who worked Group C and has winning championship designs for Super GT and Indy knows more than you do. And so does McLaren, with multiple race wins with the 650S GT3 and in contention for the championship with Flying Lizard. Sorry that their design is beyond you and that other teams are utilizing similar concepts as their CFD also suggests it works. Your VW Golf with wing that has been windtunnel tested, CFD iterated, strain gauged up, and data linked for corner speed and sector to show it reduces laptime means it works. Especially when the design is kept on a million dollar car. We have the #'s. It is available for the world to see. Your first post in this thread says it all. Disparaging work that has been proven on the track and stopwatches just because it doesn't match your aesthetic ideal. Given that's all you've been doing with nothing to back up your statements proves the same that you have stated in your last post. You've been saying nothing but these teams are doing things for show, they have inefficient aero packages so that's bad, etc etc. I may not provide numbers that for the most part are property of the race teams that design these vehicles and pay for the knowledge, but at least my posts are logical. I was just wondering if you wanted to guess how many cars at WTAC have Brilliant or Nakajima aero packages. As the individual with the Astra has said, it's obvious what works and what doesn't, and when you see what's left on the cars year after year, and designs start converging, guess what that means? I could but I'd have to kill you! Given all the work we have done on the car, we keep the data close to our chest. Downforce, spring rates, weight, HP, corner speeds etc etc are all held onto by the guy that does the ECU and data and short of beating him to death for it, nope I'm not posting it up, lest he beats me to death for it!!! As the aero was pretty good from last iteration and decently neutral, we only revised the front bar again, front floor element and bonnet to try and improve the flow balance again and to accommodate the new engine and gearbox package we fitted this year concentrating on improved drivability, tunability and power/torque. Cold Fussion wrote: Looks pretty cool, will check it out at WTAC. Thanks, it will be there. NoDivergence wrote: As the individual with the Astra has said, it's obvious what works and what doesn't, and when you see what's left on the cars year after year, and designs start converging, guess what that means? It is very easy to see the effect of a change after a few laps, coast down tests etc during testing. Driver will say it feels better, I will feel it as well and the data will show something else. By raising or lowering the front wings, raising or lowering the rear wing, changing attack angles, adding elements you can see the difference in the data be suspension compression (front vs rear), lateral and longitudinal chassis movement (stability, logged over compression/braking), acceleration, corner speeds, brake pedal pressure, throttle % and the list is endless. Even simple roll down tests can reveal a great deal when you get a decent sample set and see the way the chassis loads and unloads. We did some CFD modeling (not a stringent as using Andrew B but we still did. The modeling was the hard part!!!) and sought advice however a lot of advice mixed with trial and error got us what we have. You say a wing behind a rotating wheel works. Can you explain the physics of how it works? Just because your mate says it works is not good enough I am afraid Looking forward to your reply on this one. Remember, not everything you see on Mclarens out there are meant to ''work''. There is a style element which is important to car manufacturers such as Mclaren and Ferrari that end up on the car to capture its DNA, it does not mean it is there to do something all the time. On a GT3 car? For a feature that isn't on the road car? Here's a hint, there's airflow going AROUND the tire as well from both within the wheel well and around the bodywork. It helps by conditioning the flow structure of the wake and reducing that interaction with the diffuser in addition to making small amounts of downforce itself due to incidence angle. Take a look at which direction the wheel is rotating. Where along the tire do you expect airflow to be fastest? Why do you think many racing cars have openings behind tires to begin with? These are basic aero concepts for racing cars. Hey look, something else just got released that has airfoil structures behind a wheel! All those fussy bits are just for show and styling though, right? And I guess these just mimic what's on the road cars, right? Obviously placement and geometry together with CFD/windtunnel testing is critical as I've noted in a long ago post. I suppose it's the way how you look at it. Different people will probably see different things in a design and will make different decisions based on that. We see it in F1 all the time, aero guys switch teams and we see a whole different philosophy in those teams. I guess we can all agree that the elements are less effective behind the tire than that they would be in clean air. In terms of downforce generation on their own, absolutely. How about with regards to conditioning the wake? I'm not even saying it works in every case, as the wheelwell and bodywork for each car is not the same. But to blindly say that it is frivolous and cannot work, when there are several very successful championship winning/contending cars employing it, is fairly amusing.